As A-list stars go, Cate Blanchett tends to fly under the press radar a little bit. She's been married to an Australian playwright for nearly 20 years, so there's little in the way of salacious gossip about her personal life to feed the Internet's usual curiosity about celebs, and unless she's promoting a film or project, she tends to keep a low profile. The paparazzi do catch her here and there, though, and she's almost always carrying a fabulous bag when it happens. The majority of Cate's bags are spacious and neutral, and she tends to stick to designers whose pieces she also wears on the red carpet, where she is consistently one of the best dressed in all of Hollywood. Her personal style is sophisticated, modern, and always a little unexpected. Cate attends tons of red carpet events, but she generally hands off her clutch to an assistant before posing for event photos. Unfortunately for us, that means most of her evening bags are relegated to candid shots, which are much more rare. In her personal time, Cate seems to gravitate toward big, discreet leather satchels, and this one certainly fits the bill. This look (and this bag) are a little out of character for Cate, but there's a good reason for that: she was on the set of Blue Jasmine. Cate has had a long relationship with Givenchy; she often wears some of the brand's most avant-garde gowns on the red carpet, and she was also one of the first celebrities to receive a bag in Givenchy's new logo fabric. She was also an early adopter of the Lucrezia. I feel like Givenchy really wants to make this bag happen. 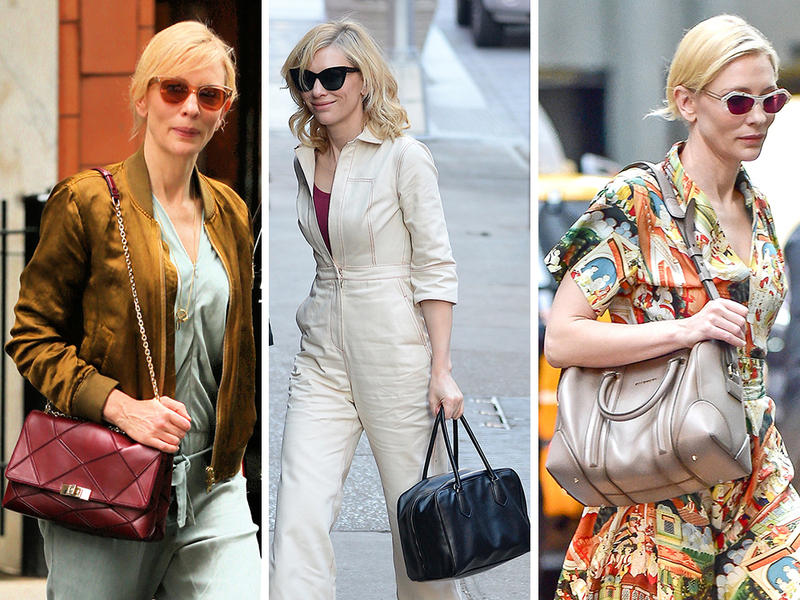 For someone who probably doesn't have to carry very much if she doesn't feel like it, Cate sure does love big bags. Even her crossbodies are pretty big. I'm honestly a bit surprised we don't see Cate wearing and carrying Prada more often; she loves clothes that are interesting and challenging, and that's Prada's specialty. This is the only of Cate's bags we couldn't identify; if it looks familiar, let us know. Cate's clothing choices are generally very high-end, but the more accessibly priced pick from Rag & Bone fits her aesthetic nicely. It's always surprised me that we don't see the Prismick on more celebrities; it's beautiful, comes in plenty of different styles and isn't as over-exposed as many celeb favorites. Flap shoulder bags are a growing trend, though, so maybe we'll see more of it soon. Cate's collection is almost entirely neutral, which makes this vivid satchel stand out even more. In some ways, the Bombette is the perfect bag for Cate: neutral, big, angular, left-of-center. I have a working theory that literally every single woman who was famous during the period that the Downtown was produced has one somewhere in her closet.